This is an amazing time saver. Today I have been glued to my computer screen doing summer camp classes with Brave Writer. In between that, I have been on the phone with various medical providers. Leaving messages. Receiving messages. Washing dishes. Running to the store. A normal day, really. After my emergency mac recipe, which is still numero uno, this is probably my #2 go-to recipe. Prep time as low as 5 minutes (read my note at the bottom). And tasty. 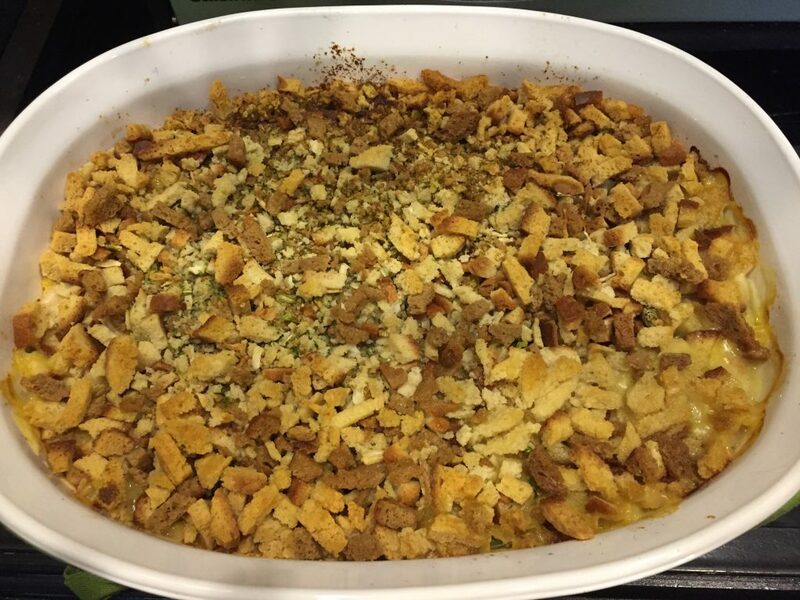 Crunchy breadcrumb topping tells no one that I spent so little time. It wouldn’t dare. If you don’t make it tonight, plan to make it soon. First, find a medium size casserole dish and grease with butter or baking spray. 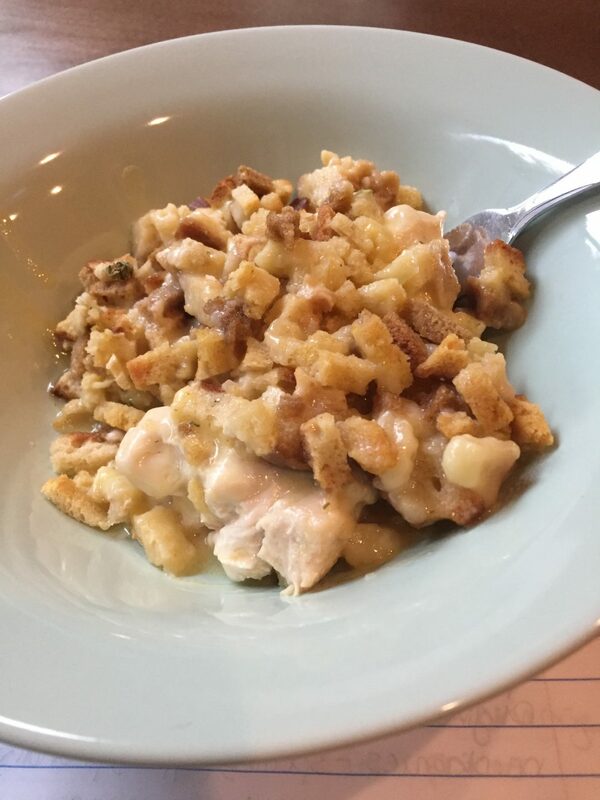 Then cut your chicken into bite size pieces* and place in the bottom of the casserole dish. Cover the chicken completely with slices of cheese. 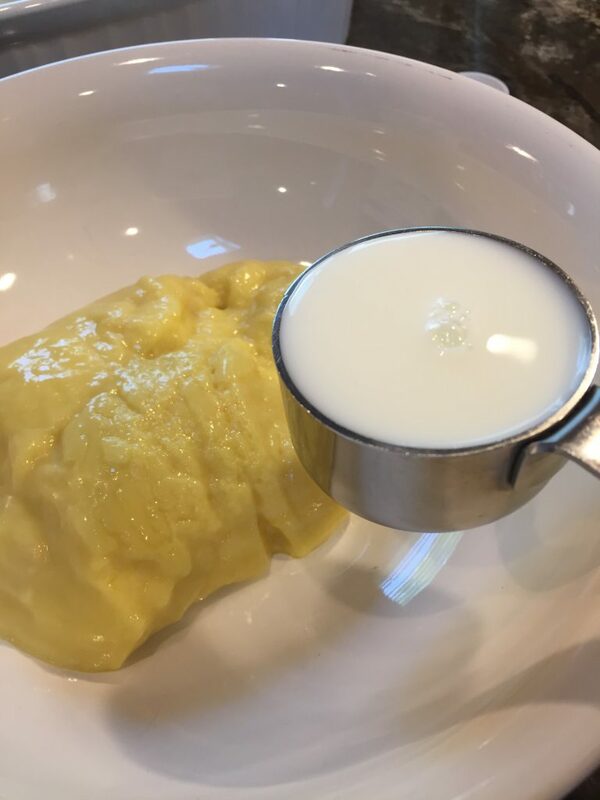 Then mix 1/4 c. of milk with the can of cream of chicken soup and mix until combined. Pour the soup mixture over the cheese and spread to cover. When ready to bake, cover the soup with the entire bag of dry (unprepared) stuffing mix. It will look like breadcrumbs. Melt the 4 Tbsp. of butter and drizzle that over the stuffing and place into the oven. Bake for one hour. Just a few things to remember. This really isn’t a casserole. There isn’t any pasta to stretch the meat, like in a lasagna. Make sure you make plenty of meat for your size crew. If you do need to cut this recipe in half to make the amount of meat you actually have, great! Just be aware that you might need “heavy” sides, like mashed potatoes and a veggie to fill you up. You might want to do this anyway if you have big eaters. Or if you live in the South. First, find a medium size casserole dish and grease with butter or baking spray. Then cut your chicken into bite size pieces and place in the bottom of the casserole dish. 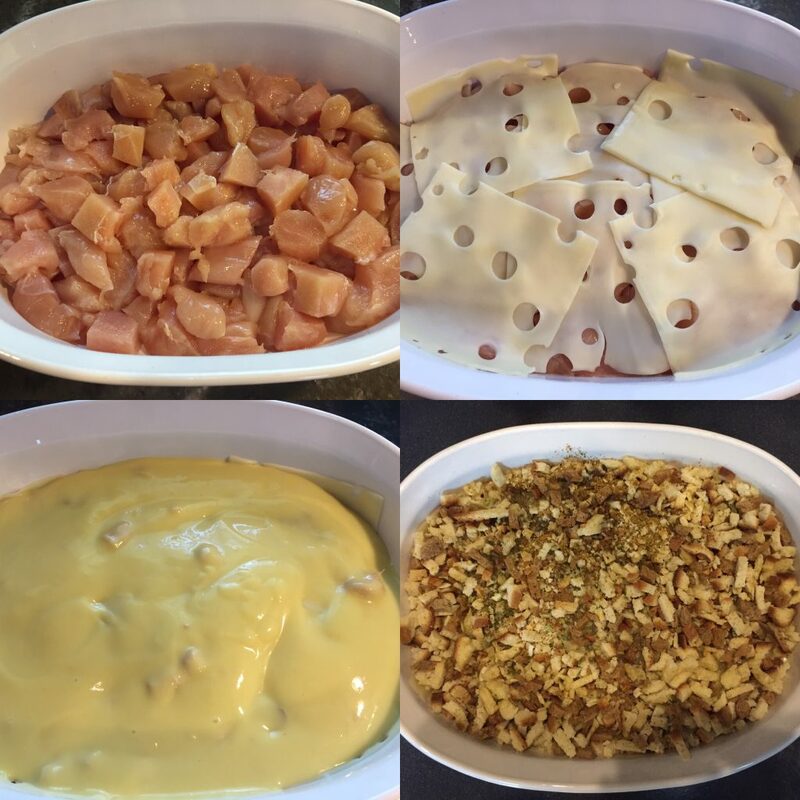 Cover the chicken completely with slices of cheese. 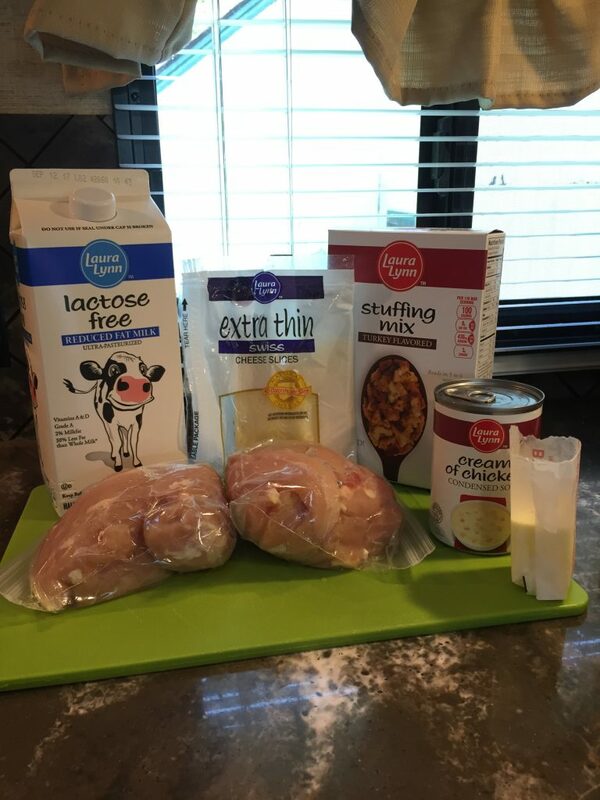 Then mix 1/4 c. of milk with the can of cream of chicken soup and mix until combined. Pour the soup mixture over the cheese and spread to cover. This is an easy recipe to make and take to a family. Most people like the combination of chicken and cheese. It is also a popular choice at potlucks when labeled. If you would like to cut the prep time to 5 minutes: have the chicken cut up in advance. You can cut the chicken when it is purchased and then freeze until the day before you need it. Thaw in the refrigerator for 24 hours before making the recipe. For those who like to mess around and change up recipes – keep reading…. This is a very versatile recipe – my favorite kind! You can change cheese slices or omit the cheese altogether. 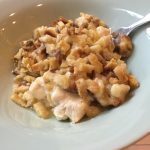 You could serve this over some steamed broccoli or even put the broccoli in the recipe in place of the chicken and make this a broccoli cheese casserole. Swap the chicken for ham. If you make swaps, just remember to cut the baking time down – the full hour is to adequately cook raw chicken. Ham would already be cooked and frozen broccoli would not need to cook an hour. I would say only bake for 30 minutes for veggies or a cooked meat casserole. Hope that gives you enough ideas to help you get creative!